Since Loïc's least favorite part of this was the painting of the fort at the end, we came up with the idea of using black cardboard and corrugated cardboard. A black shoe box, about 12 inches by 8. 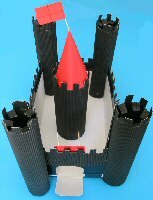 For the four towers, cut out four rectangles in corrugated cardboard, 7 by 10 inches high. Roll the rectangles into a cylinder shape and fix with staples at top and bottom. Make two 4 inch long cuts in each tower, spaced about 1.5 inches apart.Using the cuts, slot the towers into the box. Cut strips of corrugated cardboard about 2.5 inches long ready to staple them onto the walls, forming the curtain walls linking the flanking towers...(nothing wrong with a little new vocuablary!) The strips need to overlap the top of the box. 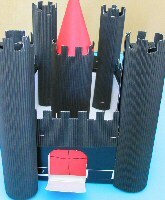 The keep (the last stronghold, which protected the Lord of the castle,), is made from a rectangle of card measuring 8 by 10 inches, (therefore smaller but wider than the others). It must be fixed in the middle of the castle. Tip for placing the keep. : Use the lid of a round carton. Roll the tower round the lid, pressing it well against the sides. Fix the lid to the center of the castle compound with double sided tape : That should be able to hold off any attacks! For the upper parts of the towers and walls crenellations are cut out. The easiest way is to make cuts at half-inch intervals; then fold every other crenellation inwards. The pointed tower of the keep is created by cutting out a circle in the red cardstock, (using maybe an upturned bowl to draw the circle). Roll up the circle to form a cone and fix it to the inside of the tower using tape. Next, an adult can deal with cutting out the drawbridge with a craft knife for a clean cut. Loïc added a kind of portcullis complete with a mechanism for opening/closing. Toothpicks are fixed on both sides of the gate and allow it to be moved about. The gate runs along a strip of paper fixed horizontally. The icing on the cake! A flag made from a toothpick and a little rectangle of paper wrapped round it is fixed on the top of the cone. The castle is big enough to fit in some really good figures. So, charge!